HELP! I need to look fabulous in 1 week!! Have you ever had a moment of intense panic when you realize that you have an event coming up and you’re maybe not looking and feeling just how you’d like to be? Perhaps it was a friend’s wedding, a birthday party or even a holiday party – doesn’t matter what it is, you likely know the feeling. 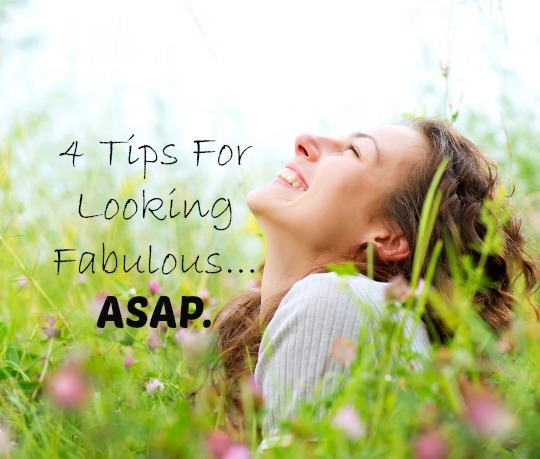 There are definitely a few tips and tricks that you can do to feel absolutely confident and fabulous in your own skin! Aim for 3L of water a day. The more water you drink, the less puffy you will be and the better your skin will be! Need help remembering? I’ve mentioned before that you can put elastic bands on your water bottle…so in this case put 6 bands on a 500ml water bottle, and each time you finish one full bottle, remove an elastic. There are also apps you can download to remind you! I know – you’re thinking ‘but I can’t’. BUT YOU CAN! And here is a little sample menu idea to show you that from breakfast to dinner and everything in between, you can do it! Lunch – Heaping salad full of veggies with this dressing and a baked chicken breast. Add some healthy fat to keep you full – avocado, pumpkin seeds, ground flax seed. Afternoon Snack – Smoothie – take your pick from here, and just make sure to include some rice, pea, bean or hemp protein and some healthy fats to it. Aim to add only 1/2 a cup of fruit to keep the sugar intake on the low end. **Note – you can make this in the morning and leave in the fridge until the afternoon and then just mix it, but if you’ve added chia or flax it will be a super thick consistency. And….there you have it! You’ll notice that it’s all of a sudden easy if you’re cooking your own food. And if you’re not cooking, here is a list of restaurants that can likely accommodate. Of course – exercise is important, however you should remember that exercise without the proper food intake, is basically useless. Also, super extreme exercise, or over exercising can be a form of stress on the body and can have longer term negative implications, including hormonal imbalances. My recommendation is to do your regular exercise routine, with some yoga added in for relaxation, and focus on making time to cook and eat the proper foods! This last one is super simple. Realize that you’re likely being hard on yourself and you look fabulous already. Focus on something you love about yourself – your smile, your eyes, your luscious locks – whatever it might be!! 🙂 Happiness creates a glow! I have a feeling that once you try these little habits for a week, you’ll be feeling SO great, you won’t turn back!